Nathan, a hairless Chinese Crested dog, has the moves! Dances like a pro! 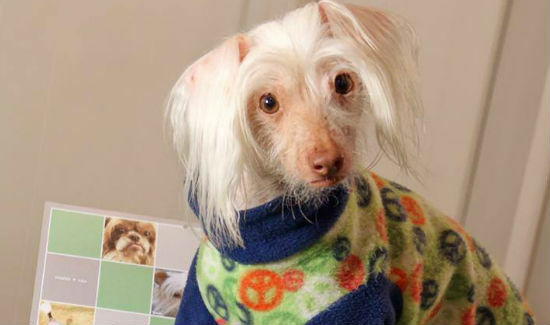 From the Bald is Beautiful rescue organization, a dancing phenomenon, Nathan, a hairless Chinese Crested dog, has emerged. Actually, Nathan has been entertaining his fans on the internet for over a year now, but Ellen Degeneres featured Nathan on her show yesterday so now his dancing is becoming even more popular. Without further ado, here are a few videos of Nathan dancing. Personally, I like “Snoopy’s Happy Dance” version as that is more fitting than any of the other songs used. I think Nathan looks very dapper in his green outfit all ready for St Patty’s Day. More videos here of Nathan dancing as well as videos of other dogs with the Bald is Beautiful rescue. The River Dance troupe better watch out, they have competition. He’s actually cute. Not ugly cute but cute cute. Most of the Chinese Cresteds I’ve seen have been in ugliest dog contests. Nathan is a good spokesdog for the breed! Yes, he is a cutie. Most are. It’s just the ugly ones really go far in the ugliest dog contests. I had to go and watch them all. Oh my… While all dogs are stars in my mind Nathan is special. Just love that face. Thanks for the smile for my day. lol.. he is a cutie!